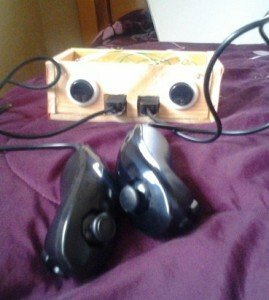 We built a video game system that can play either Snakes or Pong. We saw a project called “Arduino Pong” and wanted to recreate it with our own twist. 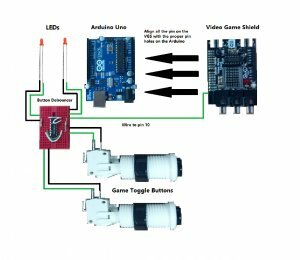 We built a small video game console using an Arduino Uno and a Video Game Shield. Two classic games, snakes and pong are written into the Arduino program. To switch between games, we installed two push buttons, one specifically for snakes and the other for pong. There is also an LED next to each button that lights up to signal which game is currently being played. We also built a 6 in. x 4in. x 2 in. box made out of quarter inch plywood to house all of the components. We had to cut holes and slots into the sides for the buttons, LEDs, and cables. For our project, we decided to use Plexiglas for the top instead of plywood, so that we could showcase it better. Assembling the project was not all that difficult; it was developing the code that was most difficult. See our code by clicking on this link: tnp. This link is the same as the first link except for pong, because the ball has variable speeds: tnp_pong_change. More examples of code can be found on the Wayne and Layne website. While we were building the project, we started by just getting one game to work just using the Arduino and VGS, so that we knew we had a working project. From then on, we started to develop the program to run two games with the option to switch between them. Then we built the button debouncing circuit and the box and put everything together.